The ADJ Mega Bar LED RC is a 40-inch (1-meter) LED lighting Bar that offers the power of RGB color mixing for stage or wall washing. The Mega Bar LED RC features an Infrared wireless remote to control what would normally require a DMX controller or adjustments made by hand on the rear panel. Aim the wireless remote at the unit and control features such as: Black Out, built-in programs, flash, DMX addressing and RGB color change. This fixture uses LEDs rated at 100,00 hours with a maximum power draw of 30W. DMX addressing may also be changed by the unit�s 4-button LED display. 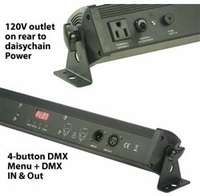 There is no duty cycle on the Mega Bar LED RC, plus users can �daisy-chain� the power from one unit to the next with the built-in IEC power Ins/Outs. � Weight: 8 lbs. / 2.8 kgs.